Minister for the Middle East Alistair Burt welcomes Prince Faisal of Jordan and discusses the situation in Syria. “I was pleased to welcome His Royal Highness Prince Faisal of Jordan and the Jordanian Olympic Team to London. Jordan and the UK are long-standing friends and allies, and I wish the Jordanian Olympic team much success. “We discussed the situation in Syria, and agreed that the appalling violence must end and that there must be a transition to a new, inclusive, government. 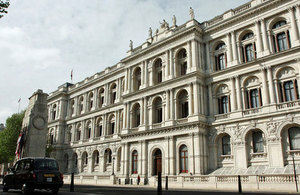 “The UK is profoundly concerned by the Syrian regime’s recent callous attack on refugees fleeing to Jordan. I expressed the UK’s appreciation for Jordan’s generosity and compassion in helping the many refugees who have fled the violence in Syria. We have recently doubled our aid to help those affected by the fighting in Syria, including doubling our funding to UNHCR ‘ s work in the region, which will deliver emergency aid to Syrian refugees in neighbouring countries, including the new camp that was opened in Jordan yesterday.